I have 2 old pins: one Eastern Star pin (?) and one gold star with a gavel attached. Both are very old ( 50-75 yrs ? ) They have been in my family for a long time. Both my mother and father have had Mason members in their families. Is there anything you can tell about these pieces? I have attached 2 photos. Simon: The Eastern Star organization, one of Freemasonry's appendant bodies, has both male and female members, but is predominantly female. Each symbol within the star is an emblem for the historical female heroines Adah, Ruth, Esther, Martha and Electa, (in this order) whose stories inspire character building lessons. Members of all religions may join, however each member must believe in a Supreme Being. Would an O.E.S. member be so kind as to help Jean understand more about the Eastern Star organization, and the symbolism of her Eastern Star jewelry? Thank you for writing, Jean. Hope this was helpful. It also says "Pilgram Chapter NO. 804 O.E.S. Byre De Camp ....W.P. I became interested when I saw the emblem on a ring someone was wearing. Came home and Googled "Eastern Star", then looked for this old gavel. Loved that Grandmother...she was one of the best! There is not a lot that is secret in the Order of The Eastern Star, but some is. The pin in the pictures is an ordinary pin worn by any member male or female. The Star points are as Simon says so I won't repeat. The symbol in the center is the altar; the symbols in the points are emblems of the Heroine of that point. Each has their own color which also has significance and each represents a quality we should strive for in our own lives. 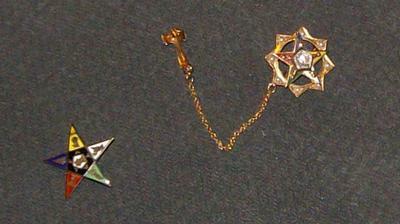 The pin on the right is the same, but is more ornate because the attached gavel tells you that the person wearing the pin is a Past Matron. The Worthy Matron has charge of the Chapter. While men may be members, they must be Masons and may never hold the highest station of the chapter. Worthy Matron is the highest station in any Chapter, be it Grand Chapter or Subordinate Chapter. The Order, itself, is not Masonic but works closely with the lodge in that we are a benevolent order giving aid to the orphan and widow. Simon Says: Thanks, Karen. Nice job! Would anyone else care to tell more about the 5 heroines or the colors that are associated with each of them to help others learn more about the O.E.S. ?